I won’t sit here and pretend I always get tweets from @Audi, but when I do I drink Dos Equis. Wait… wrong marketing campaign. What I meant to say was when Audi tweets me a weirdly personal link with little to no description, I darn well click through. Glad I did here, as it led me to their Iron Man 3 promotion, Steer the Story, a surprisingly interesting development in crowd-sourced digital comics. Audi’s Steer the Story campaign features an Iron Man comic where certain events are dictated by audience votes or contest submissions. Instead of finishing the last page of Invincible Iron Man and wishing like heck Tony would just use his stupid repulsor rays for once, you actually get to vote for that action here. OMG Just BLAST Blizzard already! While this essentially sends artistic freedom soaring out the window with a bag of bourbon in its sensitive fist, it makes for some mildly interactive reading. I can’t tell you whether writer Jeff Parker and artist Manuel Garcia resented the voices of the masses interfering with their short story (major plot point: Pepper, we seriously are riding the HECK out of this Audi R8), but I’d guess not really. While I don’t think anyone would want to see crowdsourced comics become the norm, it does offer an occasionally interesting digital option. If you have a kickstarter or webcomic and want to increase fan engagement, crowdsourcing outcomes might be a cool option. Especially if you’re inclined to set up an Elseworld version of the story when your fans pick, like, the worst option. The Audi Iron Man comic also offered up a digital reading enhancement that is either under-explored, or just unfamiliar to my sheltered eyes. And that, of course, is the semi-3D flying object. The static image might not do the flying ice justice, but as you scroll through the actual comic the intended effect is more clear. This highlights the other intelligent design here: the comic reading experience is clearly designed for digital readers like the iPad. While I don’t expect a corporate-sponsored promo to revolutionize digital, it’s another good sign that Marvel (and big brands in general) are embracing this crazy thing called the mobile internet (it’s, like, everywhere man). This comic may not fit into the best iron man comics to read before Iron Man 3, either, but there are some interesting components to the experience. 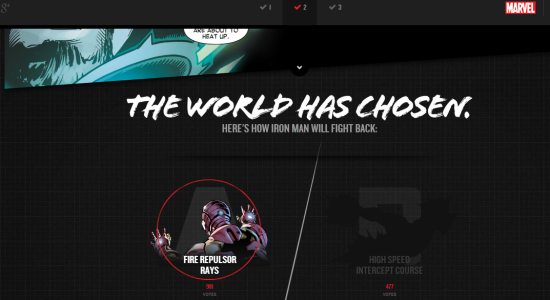 Final note on this one: If you want to check it out, the Steer the Story promotion is live until the US release of Iron Man 3 on May 3 (omg omg omg so close!). 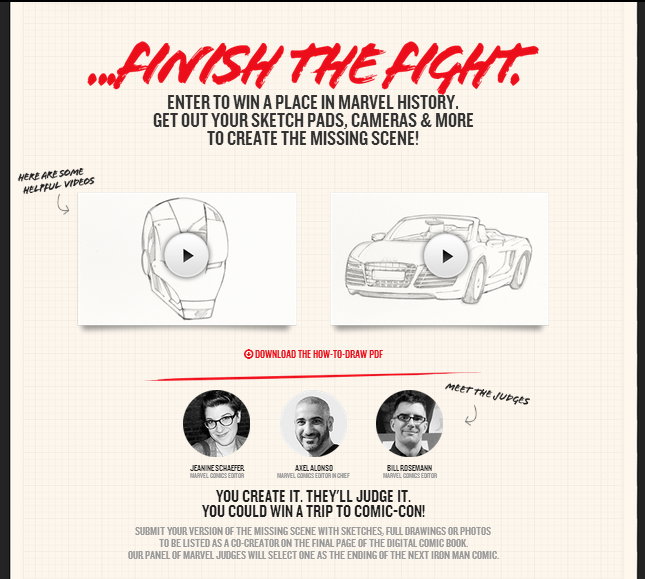 The contest part of this promo is the chance to draw/artistically style the final fight scene between Iron Man and Blizzard (suggestion: TWIST ending where Blizzard cryogenically freezes Stark and encases himself in the plaster mold to come out as a STARK CLONE, completely tricking Pepper into believing/smooching him as Tony. What’s that? A villain inhabiting a hero’s body will never work? You’re right, you’re right, it was too crazy). Again, if you do want to take a look, the whole comic is up at www.steerthestory.com. Think this is a dumb/awesome/interesting idea? Do what feels right to you in the comments.